FANTASTIC Location, only a short walk of approximately 170 metres to the main shopping precinct and very close to the supermarket. Easy walk to both surf and bay beaches and the beautiful Sorrento park. 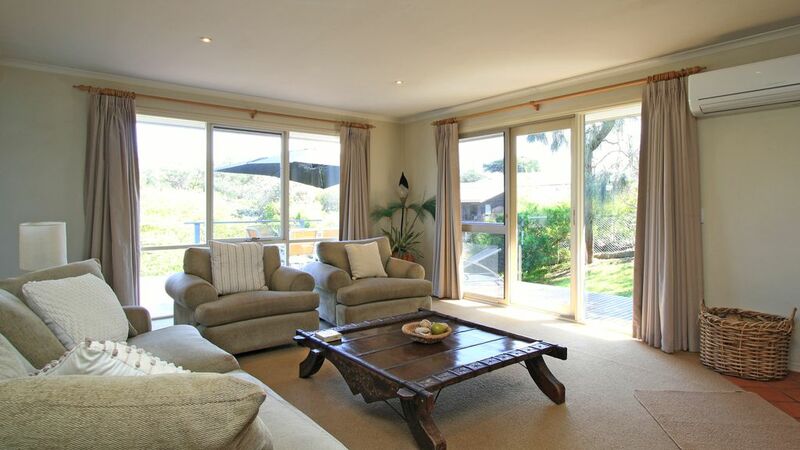 The house is well appointed and has a welcoming and relaxing ambience for your perfect holiday. Have coffee on the corner, visit galleries, peruse the boutiques or stay at home and relax on one of the decks. Alternatively, light the fire and snuggle up. Please Note: Linen, towels and cleaning are included in the rate. Master bedroom King size bed ( can be separated into 2 singles ) ensuite and walk in robe. Third bedroom comprises 2 long singles that can be joined as a king when requested. Main bathroom has bath and shower. 2 separate living areas provide you with plenty of area to relax.Both open out onto a large deck with treetop outlook. There is plenty of space for children to play. Coonara wood fire with wood supplied. Panel heaters in 2 bedrooms. This is a non smoking property. Please use outdoor areas for smoking. SCHOOLIES PLEASE DO NOT APPLY. We have been coming to Sorrento since childhood for our memorable family holidays. This house was just what we were looking for....Homely with a beach house atmosphere where we can relax and enjoy seeing all that sky. Being so close to shops, beaches, parks, restaurants etc. frees our guests up to explore the area without having to rely on transport. A large reverse cycle services the living areas. Portable fans are provided for bedrooms. Single carport only. Plenty of car parking space. There is a large area of lawn with plenty of space for children to play. Large balcony /deck leading from kitchen and lounge. Outdoor setting and umbrella. Tennis courts are within easy walking distance. There are a number of beautiful golf courses from 5 to 20 minutes drive away. Lovely house with great amenities. The house is in a great spot with such a short walk to the shops and the water. It is a quiet street and even though it is surrounded by houses it feels and looks secluded with all the trees. We love this house tucked away in a quiet street just a few minutes walk to the main part of Sorrento. Has everything you need and is clean, well equipped and very comfortable. Great location and would definitely book again. Perfect location, leave the car and walk. Well maintained, comfortable and quiet off the road property. Left the car and walked 5 mins to cafes, shopping and restaurants. Was a hot week and very glad of good air conditioning. Enjoyed immensely by our family of 4 adults and one busy toddler. Thank you Cheryl for your quick replies to our queries and we are aiming to return for another visit. Highly recommended spacious 3 bedroom house which had everything one would need for a holiday. Very clean and very friendly, would stay here again. Thank you for your review. We try hard to make your stay enjoyable and are pleased that our lovely house is appreciated. You were a wonderful guest. It was the perfect house and location to spend Christmas with the family. The property location was a few minutes walk of both the shops and the beach so no need for the car apart to explore the peninsula. The house was very comfortable furnished with 2 sitting areas, Adding to the feeling of space. The outside dec was also great for dining in the evening and taking in the last of the evening sun. We are fortunate to have guests such as yourselves stay in our house. Thank you for taking care of it. Knowing that you had a lovely stay makes us happy. The title says it all. It is a tucked away from the road beside unit 17 so keep a lookout for it! Lovely host who provided much needed help and assistance when needed. Much appreciated indeed! Thank you for your cheery review. We are pleased that you appreciated the location of the house.